The Hampton Inn and Suites Orlando Airport at Gateway Village features an outdoor pool on site and offers a daily continental breakfast. Complimentary WiFi is provided for all guests. An airport shuttle is provided for all guests. 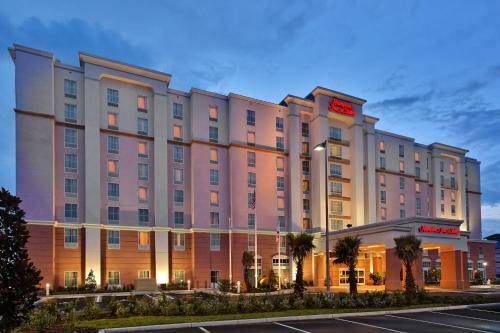 This hotel is 20 minutes’ drive from SeaWorld Orlando. Rooms feature a flat-screen TV with cable channels. A refrigerator and coffee maker are provided as well. Select rooms include a microwave and a seating area. A fitness centre is on site at the Orlando Gateway Village Hampton Inn and Suites and guests will also have access to a laundrette. An airport shuttle is available for added convenience. The hotel is non-smoking throughout. The Orange County Convention Center is 15 minutes’ drive from the hotel. Universal Studios Florida and Walt Disney World are 20 minutes’ car ride away. Please note that a fee will be assessed for guests found smoking in guestrooms. Please note that packages will only be received 48 hours prior to arrival for guests who have a reservation. Package holding incurs a fee. Please contact the property for details. Guests are required to show a photo identification and credit card upon check-in. Please note that all Special Requests are subject to availability and additional charges may apply. the hotel Hampton Inn & Suites Orlando Airport at Gateway Village so we can give you detailed rates for the rooms in the desired period.